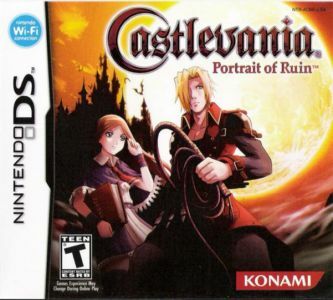 Castlevania: Portrait of Ruin gives the player control of two different characters. The pair ... vampire hunter Jonathan Morris and Charlotte Orlean, a young girl with magical abilities ... must work to thwart a plan to resurrect Dracula's Castle and unleash a reign of evil upon the unsuspecting world, all within a new World War II setting. The new setting captures the chaos and suffering the era, with thousands of lost souls wandering the world in search of salvation. Desperate to escape the limbo within their exist, the misguided spirits seek to rebuild Dracula's Castle from its ruins, and are lead by a pair of evil Vampire sisters out to resurrect their master's home for their own nefarious plans. Thrown together, Jonathan and Charlotte must combine their unusual skill sets to defeat the plans and restore harmony. Retaining the same 2D platform realms for which the series is famed, Castlevania: Portrait of Ruin uses a side-on view to oversee the scrolling stages. Players can switch freely between Jonathan and Charlotte as they progress through the levels, using their skills when appropriate. In addition to Jonathan's weapon expertise and Charlotte's spell-casting, both characters can utilise all-new 'Summon' attacks to raise demons to assist them against the Vampire sisters' army. Similarly, more conventional weapons can also be found on route, and saved for use against the hardier monsters that await in the shadows. Featuring all-new locations and a cast of over 100 different adversaries, Castlevania: Portrait of Ruin marks a welcome return to the DS for the series.